AKA Frederick Phillips Brooks, Jr.
Computer engineer Fred Brooks worked at IBM during the early supercomputer era, where he was part of the teams that developed IBM's pioneering Stretch and Harvest computers. He coined the term "computer architecture", and later oversaw development of the IBM System/360 — the backbone of the first generation of commercial computers — and managed the software team that designed the OS/360 operating system. His work is seen as defining the still-dominant concept that distinguishes between computer hardware and software, and allows the separate but dynamically interlocking development of these two fields. He is well known for what is now called Brooks' Law, which summarizes problems inherent in increasing the staff of a troubled project: "Adding manpower to a late software project makes it later." He has said that a central element of his team's success with the IBM 360 is that as the project progressed, his team effectively "shut out" interference from the company's hierarchy. 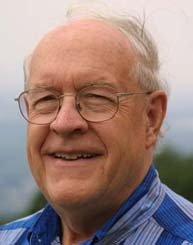 Since leaving IBM in 1964, Brooks has taught computer science at the the University of North Carolina at Chapel Hill. His work over recent decades involves virtual environments, comprised of real-time, three-dimensional, computer graphics which have helped biochemists understand the structure of complex molecules and allowed architects to create "walk-through" motion pictures showing the interiors of buildings based on architectural plans. Despite his association with IBM, Brooks said in a 2010 interview with Computer World magazine that his favorite computer is a Macintosh laptop.